I had some materials left over after building my solar tracking heliostat for lighting and heating my home, so I decided to make a miniature version for cooking hot dogs. This is fairly simple project (it only took me a couple hours to build after working out the proper dimensions) and it works great. 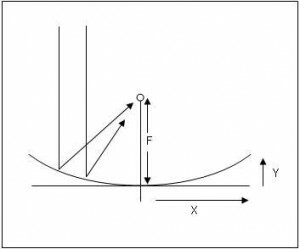 In order to focus parallel rays of incident light like those from the sun on a fixed point you need a parabolic mirror. There are a few different ways to generate a parabolic curve, but the easiest to understand (though not necessarily the easiest in practice) is simply doing the math. (where both X and Y are in inches). Draw a grid with 1″ spacing on one of the 2 sheets of plywood to be used for the sides. similar to that shown below, and plot the curve. Then simply cut along the curve with a jig saw. You can repeat the process on the second sheet or use the first sheet as a template to trace the curve onto the second (or if you are a brave enough, you can attempt to cut them both at the same time… clamp them together well first). Attach the sides to the 2x4s that will become the ends. I used 3″ #10 screws because they were handy, but 2″ screws are probably long enough. Draw a line across the center of the backing (the 18″ x 4ft sheet of 5/16″ plywood) dividing it into two halves (each 18″ x 2ft). Line up the backing with the sides and put a small screw (I used 3/4″ #6 screws) through the center line on the back and into each side at the origin marks you made. Every 6″ or so, put another screw through the backing into each side until you have attached the backing to the sides along the entire length of the sides (bend the backing to match the shape of the sides as you go). Now glue your mylar or tin foil to the inside surface of the backing. Spray adhesive works well. Try to smooth out the surface as much as possible. Any little wrinkles will reduce the efficiency of the cooker. You can see that I wasn’t that careful myself. 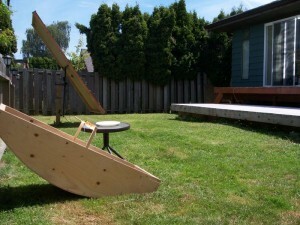 The parabolic mirror you have created has a focal distance of 18″, but the sides are only 12″ wide. I designed it this way (It could have just as easily been made with sides 18″ wide) so it wouldn’t be so big. Therefore, you need a way of holding your skewer 6″ away from the top edge of each side. I did this with a couple pieces of 1/2″ plywood cut to about 12″ x 3/4″, but you can use any material you have available. Screw these pieces to the center of each side so they stick out a little over 6″ to hold the skewer. If you want you can make them pivot so they can fold out of the way when not in use. Make a notch in the end of one skewer holder, and drill a hole in the end of the other. The sharpened end of the skewer will stick into the hole. The other end of the skewer will rest in the notch. 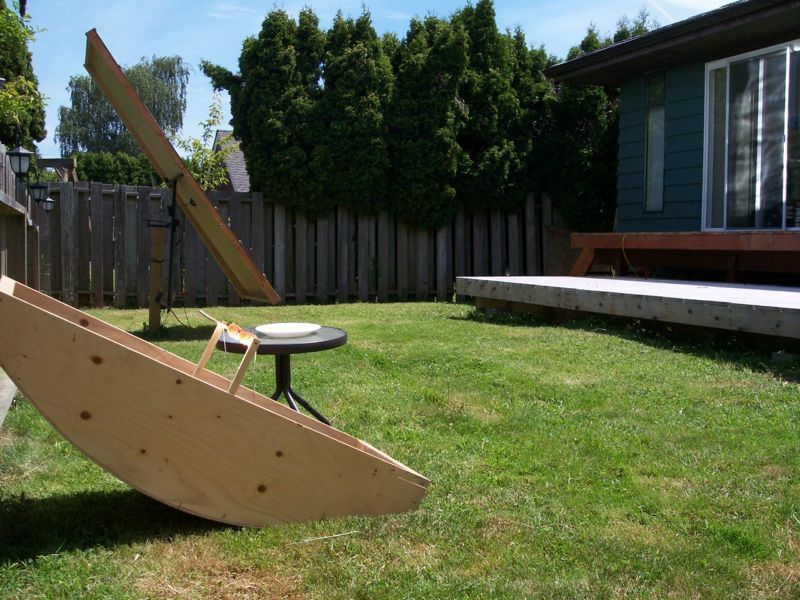 On a sunny day, lean your parabolic cooker up against a fence or deck or whatever you have available (or you can design in an adjustable stand). Adjust it until it is aimed directly at the sun. The easiest way to tell when it is aimed correctly is to look at the shadows cast by the two skewer mounts. When you can see a shadow cast on the inside surface of each side, then the cooker is aimed in the right direction. When both shadows pass through the origin of your parabola then the cooker is tilted to the right height. You will have to adjust the cooker from time to time as the sun moves (or rather as the Earth rotates). Be patient. 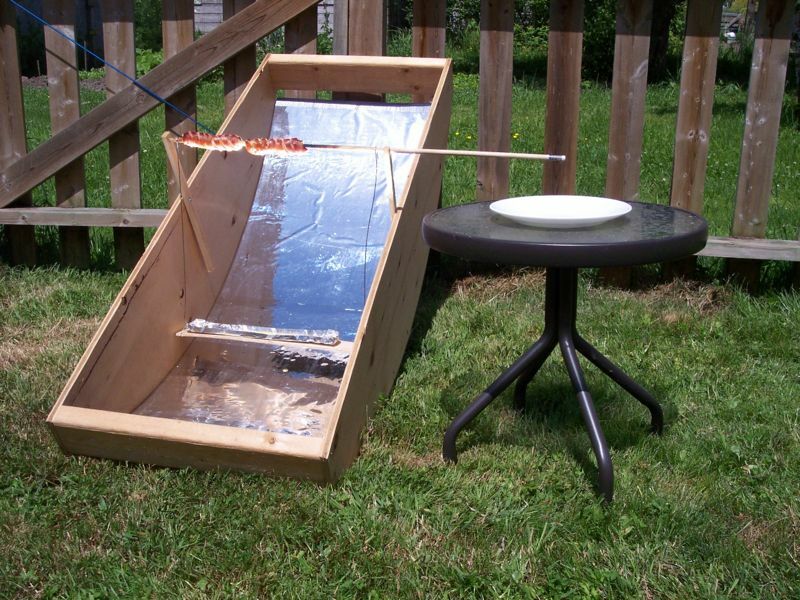 My experience with solar cooking is that it looks like nothing is happening (you don’t hear anything or see anything) until suddenly, your hot dog starts blistering and/or your skewer catches on fire. It takes a bit of practice to learn when you should rotate your skewer. I find it takes about 6 minutes to cook ordinary weiners, and 8-10 minutes to cook the large smokies you see in these images. I try to rotate the skewer about once every couple minutes. The image below shows the finished product. The sides and back are constructed of plywood, with a 2×4 at the top and bottom. The mirror is made from silvered mylar that I purchased to test on my larger mirror array. It turned out to be a poor choice for that project, but works great for this one. Aluminum foil would likely work too. I used a wooden dowel for a skewer. The particular hot dogs I’m cooking have built-in cheese which drips pretty badly, thus the improvised drip tray hanging from the skewer. The image below is a side view. Note the much larger tracking mirror array in the background reflecting sunlight onto the sliding glass doors to the right. At noon on a clear day, the tracking mirror array puts about 2 kW of free heat into the house, and lights up the room just as if it was a south facing window. It’s quite surreal. The image below is a closeup of my lunch. Note the charred dowel. Solar cooking (on a cooker this size) does not progress very quickly, but it does progress faster than it appears to be. The process is relatively uneventful until something suddenly catches fire so don’t be fooled if it looks like nothing’s happening, and don’t turn your back for too long. These large hot dogs took about 8 minutes to cook, rotating 1/4 turn every 2 minutes or so. The design could be improved by mounting a smaller flat mirror (maybe 3″ wide) opposite the hot dogs from the parabolic mirror, thus cooking from both sides at the same time. I originally posted this article on another site. 90% of the comments I received were simply to say how awesome the project was, but here are a few that offer some additional information. to make one about the size of a shoe box what would the demisions be? To Joe… I think you’ll have difficulty cooking anything with a parabolic reflector the size of a shoebox. However, if you’d like to try, just scale down the measurements I used. A shoebox is about 12″ long while my cooker is about 48″ long, so just divide all the X and Y numbers by 4 and draw your grid with 1/4″ squares instead of 1″ squares. I liked your cooker so much that I decided to build one my self. It’s 0.75 meter wide, and 2.50 meter(approx 98.5″)high. It weighs some 40 kilograms I guess….. Took my only a couple of hours work. I did cut the sides in one pass: I used some twenty screws to fasten them together. Just as I wanted to test the beast, a cloud decided that there was enough sunlight for the day…. Thanks, Klaas. I’ve built one a year ago that is 4×8 feet in size. My version is designed for space heating in the winter, where the absorber is only 1×4 foot copper plate with one copper pipe, and acrylic front panel, that increases the efficiency and water temperature considerably even during 0-15 degrees F periods. The sun will focus on the absorber for for about 3-4 hours and “shut off” passively during warmer weather periods. BUT…be very careful, since it does not take much to damage your eyes with this kind of brightness at the focal point! For those less inclined, PITSCO sells something simular( for alot of money ) already made. I love to see this stuff. I have been building/operating/maintaining utility grade solar thermal parabolic trough power plants here in the Mojave Desert under three different companies(LUZ/KJC/FPL) for the last 22 years and anything that gets the word out is great. Someone earlier said that a shoebox-sized solar cooker doesn’t work. I am a former high school teacher. We made solar cookers for a project, and the smallest box cooked a hotdog to a black crisp on a clear day but only 50 degrees. Check out the webquest at http://www.nctm.org/resources/content.aspx?id=22453. What the heck?!?!?!?!!? More simple instructions please. I have to do this for one of my classes and thisi makes sense until you say some crap about a formula!!!! While it’s true that not everyone may be technical enough to work with the formula given, you may have better luck getting responses and help from the author (and/or readers) if you at least try to be polite. Hi! I really like your projects, but i have to say that it would be alot easier to understand all the steps in this guide with a bit more photos. Agreed. Unfortunately I built this long before I had any intention of posting instructions for its assembly. Therefore I could only take pictures of the finished product. Sorry. i dont get your formula at all make it so people can do this quick and easy most of the people making the cookerss are kids in science fairs and projects. SO EASIER INSTRUCTIONS!!!!!!!!!!!!!!!!!!!!!!!!!!!!!!!!!!!!!!!!!!!!!!!! If you don’t understand the formula you can ignore it. Just draw a grid on 1″ centers on your plywood as shown in the picture. Then draw the parabola matching the blue line in the picture. Cut along the line. Simple. It is interesting that with a small focal point (4″ – 10.16 cm) the curve is much ore pronounced and the focal point is located in the sides of the device. We made 3, all 12″ wide by 24″ long with one focal point at 4″, one at 8″ and one at 12″ to compare the rate of heating and see if there is a difference (there shouldn’t be). We will then use different reflective surfaces to see which works best. Thanks for the plans, it was alot of fun to do. Grill marks? False advertisement! Hail Meat! @ Dr. Grill: Click the picture for a closeup and you will see those are not grill marks. They are slice marks. For the best smokies I make a series of diagonal slices on both sides. This avoids blistering and cooks the inside without burning the outside. I do this whether I’m cooking on a BBQ or solar cooker or in even in the microwave. 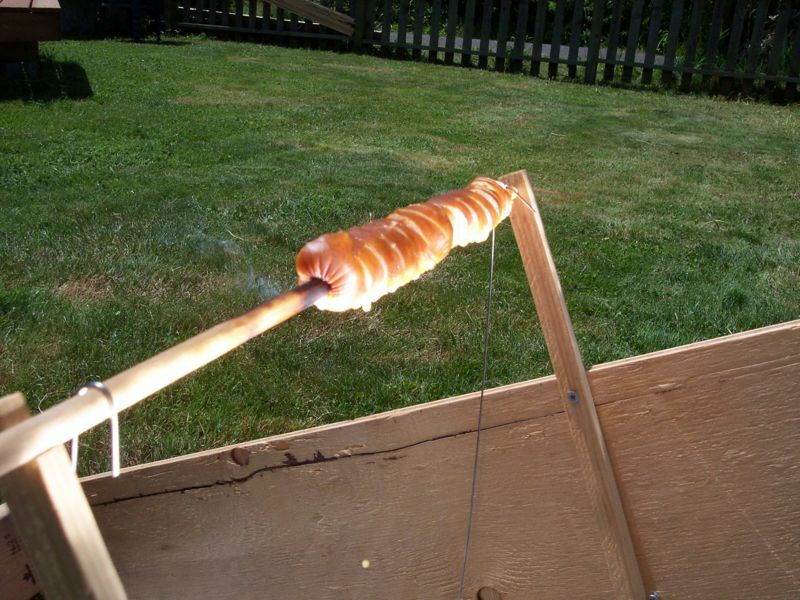 It’s just the single best way to prepare a smokie for cooking. Try it. You’ll agree.